A note on LDL cholesterol and Lipoprotein (a) written by Pauling on his office chalkboard. 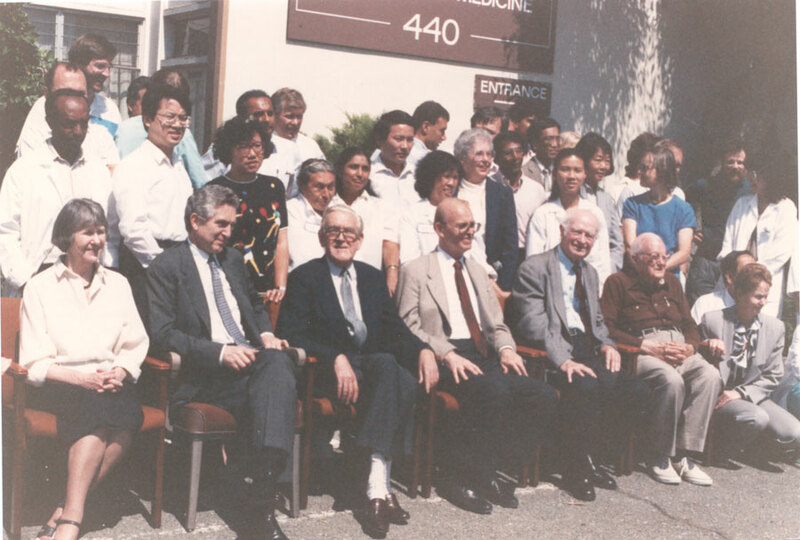 In June 1992, Linus Pauling visited the Texas Heart Institute, after which he accepted an offer to write an editorial for the organization’s journal. He completed his short piece, “Can Vitamins Help Control Heart Disease and Strokes?” in March 1993, a little over a year before he passed away. The Texas Heart Institute article turned out to be Pauling’s final public statement of consequence on the question of ascorbic acid and cardiovascular health. In his text, he argued once again that, although physicians had long known that arterial lesions cause heart disease, they had not yet accepted the evidence that lesions are brought about by low levels of vitamin C in the blood. This consensus had been maintained despite a widely accepted understanding that vitamin C is necessary to repair bodily tissues via collagen production. Unfortunately for Pauling, the research required to clearly to shift scientific opinion was not forthcoming. Pauling realized that a major study needed to be funded to show a strong relationship between intake of larger doses of nutritional supplements (especially vitamin C) and even greater preventative or therapeutic health benefits for victims of cardiovascular disease. As the idea’s chief proponent, Pauling would have seemed to be a primary figure in attracting grant funds for such a study. However, in part because of the intense controversy over Pauling’s previous work with vitamin C and the common cold, and vitamin C and cancer, Pauling’s reputation had been badly marred within the medical mainstream, and research dollars had become very difficult for Pauling to source. Partly as a result, his and Matthias Rath’s work stressing the importance of vitamin C as a key factor in combating heart disease was perhaps a case of too little, too late. Though the tandem had succeeded in establishing a general sense of the potential importance of vitamin C in heart disease prevention, the circumstances surrounding their work were not ripe enough for the duo to develop a more complete and lasting understanding of the types and levels of nutrients needed to ensure optimum heart health. Linus Pauling giving an interview at Deer Flat Ranch, September 1993. Other material considerations further compounded the problem. For one, at precisely the same time that the cardiovascular work was gaining traction, the Linus Pauling Institute of Science and Medicine was in the depths of dire financial straits. 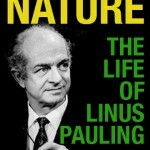 Furthermore, Linus Pauling was now nearly 93 years old and in declining health. As he battled with the cancer diagnosis that would ultimately claim his life, Pauling realized that could no longer go on assisting Rath. Meanwhile, Rath’s relationship with others in the Institute had fallen into turmoil, and the Linus Pauling Heart Foundation, which Rath directed, was withering on a vine of financial insolvency. Rath was ultimately asked to leave the Institute amidst a period of legal disarray, partly a result of his having never signed the Institute’s mandatory employee patent agreement. In the wake of his departure from the Institute, and following the death of Linus Pauling in August 1994, the Unified Theory of Human Cardiovascular Disease largely slipped into obscurity, though some echo of it has remained in the public consciousness. In the years that followed Pauling’s death, the Institute’s cardiovascular program continued to investigate the role that nutrients like vitamin C, E, and B6 might play in limiting oxidative damage brought about by low density lipoproteins (LDL) in individuals suffering from atherosclerosis. Similar work is on-going today in multiple laboratories. At present, the scientific understanding of the importance of vitamin C in preventing or treating heart disease remains somewhat mixed. Although vitamin C does not appear to directly lower blood cholesterol levels, evidence exists that it does significantly lower low density lipoprotein and Lp (a) levels, which in turn helps to protect arteries from blockage by these cholesterol-carrying molecules. Total blood cholesterol may also lessen with increased vitamin C intake due to the fact that vitamin C is an HMG-CoA reductase inhibitor, meaning that if vitamin C levels are high, the body manufactures less cholesterol. Additionally, vitamin C’s benefits to the body as both a primary collagen producer and as an antioxidant contribute to what most studies agree to be a significant, though still not fully understood, protective effect against heart disease when taken in doses of 400 to 2,000 mg daily. As in Pauling’s era, this level of supplementation is far above the current Recommended Daily Allowance for adult men and women, which is 60 mg per day. Likewise, the interaction between lysine and vitamin C that many of Pauling’s case study patients found to be highly therapeutic – with anecdotal reports of actual reversal of atherosclerosis in certain patients – has not been investigated further. And so it is that, more than twenty years after his death, Linus Pauling’s ideas on the impact that nutritional supplementation might make on heart health remain just as tantalizing and out of reach as they were when Pauling was alive and active. 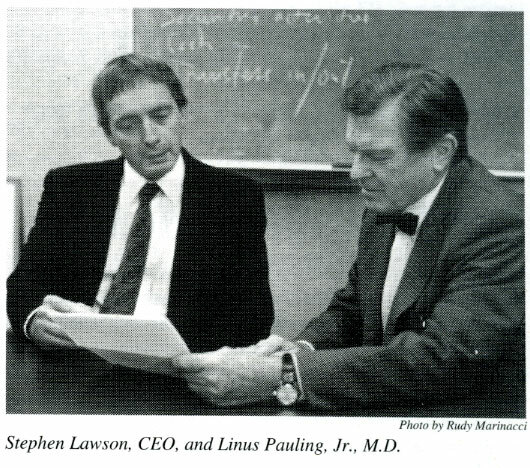 In early 1991, Dr. Howard Bachrach of Southold, New York informed Linus Pauling of experimental results indicating that lipoprotein (a) [commonly abbreviated as Lp(a)] binding to arterial walls could be suppressed through the use of supplemental lysine. 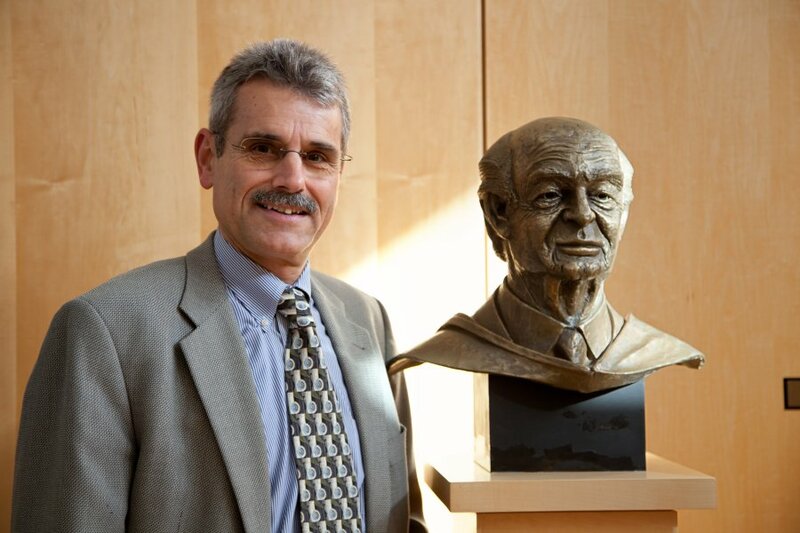 In the weeks that followed, Bachrach continued to exchange information with Pauling and his colleague at the Linus Pauling Institute of Medicine, Matthias Rath, in hopes of determining if lysine, vitamin C, or some combination of the two might not only prohibit but actually reverse plaque accretion in vitamin C-deficient guinea pigs. A breakthrough came about on February 28, 1991 – Linus Pauling’s 90th birthday – when Rath reported to his colleagues his finding that Lp(a), as synthesized in the liver, was in fact regulated in an unknown way by the amount of vitamin C present in the body. Lp(a) was understood by Rath and Pauling to form from low density lipoprotein (LDL) and Apoliprotein A-1 [abbrevied apo(a)] in the liver in amounts largely determined by the rate of synthesis of apo(a). This rate of synthesis was increased by low vitamin C concentrations in the blood. Rath and Pauling published the finding in Medical Science Research, arguing that plaque formation was not caused by LDL cholesterol, as previously thought, but lipoprotein (a) instead. Crucially, high doses of vitamin C was identified by the authors as being central to reducing these dangerous lipoprotein (a) levels. This discovery formed the basis for what Pauling and Rath would eventually call their Unified Theory of Human Cardiovascular Disease. Fundamental to this framework was Pauling and Rath’s belief that cardiovascular disease was a degenerative disease caused by vitamin C deficiency. The theory also put forth that humans’ inability to synthesize their own vitamin C drove the disease, though it was also aggravated by genetic defects and exogenous risk factors, such as free radicals introduced by cigarette smoke or oxidatively modified triglyceride-rich lipoproteins exerting a noxious effect on the vascular wall. 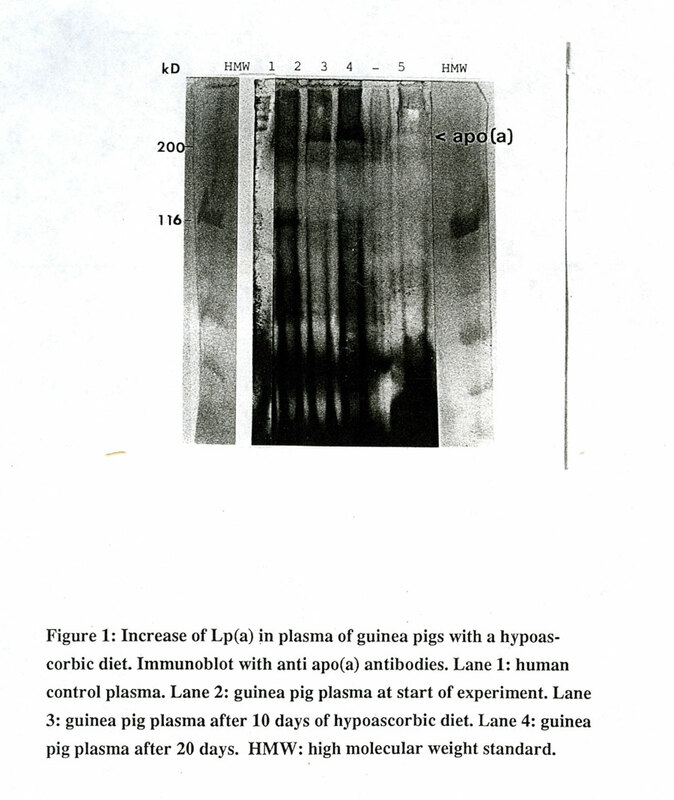 Further, lipoprotein (a) was put forth as an evolutionary surrogate for vitamin C in animals – like primates and guinea pigs – that no longer produced their own ascorbic acid. This collection of species shows much higher levels of Lp(a) in the blood, a characterstic seen by Pauling and Rath as serving as an ad hoc biological mechanism used by the body to repair damaged tissues through deposit on weakening arterial walls. Too much Lp(a), however, leads to plaque formation, causing angina, heart attack, and stroke. A lack of vitamin C thus leads indirectly to the deterioration of arteries. From there, the researchers argued that this problem could be easily fixed if only the recommended doses of vitamin C were increased to levels many times larger than those prescribed by the federal government. Were the body enabled to make use of supplemental vitamin C to produce collagen – as all animals that synthesize vitamin C internally do – humans would be much more efficient at repairing damaged arterial walls. Indeed, vitamin C could function not only to strengthen arterial walls, but also to reduce the amount of Lp(a) being produced by the body and consequently – as a co-factor in the hydroxylation reaction that converts cholesterol to bile acids – lowering the amount of free cholesterol in the blood as well. Published in the Linus Pauling Institute of Science and Medicine Newsletter, March 1992. To Pauling and Rath, the logic supported their theory was clear. Critics, however, demanded large clinical studies to support the claims, and this was research that the Institute, which was struggling mightily for funds, did not have the resources to pursue. It was at this point that other interested researchers took up the torch. 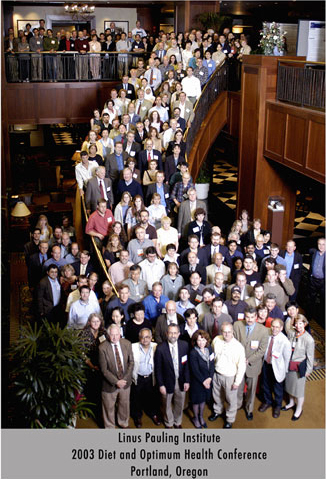 One of them, Dr. James Enstrom at UCLA, led a 1992 study of over 11,000 human subjects. Enstrom’s work indicated that those individuals who regularly took supplements of vitamin C at federally recommended levels enjoyed significantly lower rates of heart disease than did those not subscribing to a supplementation routine. This data led Enstrom’s team to wonder – in tandem with Pauling and Rath – whether larger doses would achieve an even greater protective effect. 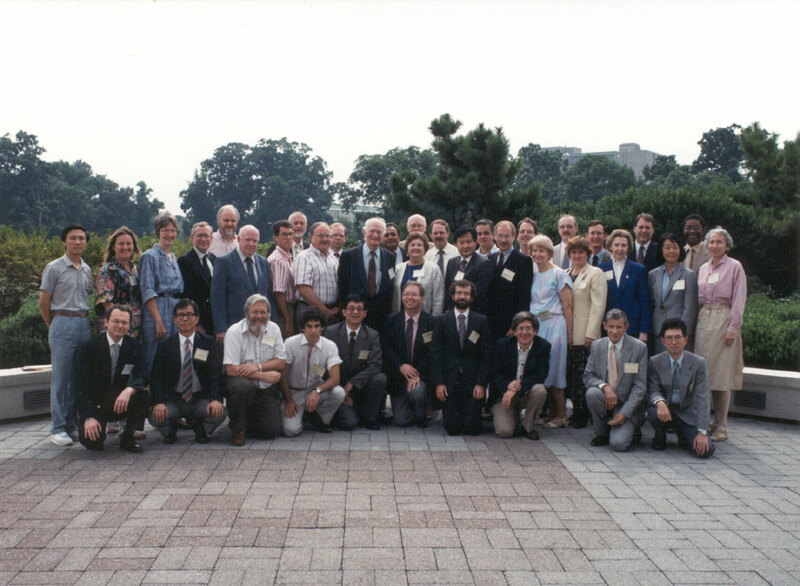 In 1993, hoping to add additional support to the hypothesis, Pauling published three case studies in the Journal of Orthomolecular Medicine. Each study focused on individuals who had suffered from severe cardiovascular disease and undergone surgical procedures, including heart bypass. The individuals in question had read Pauling’s papers with Rath and had decided to try adding lysine and vitamin C to their diet. In certain cases, members of the study group had already been taking fairly high doses of vitamin C and then added lysine. The 1993 data clearly were not anything like controlled studies and were reported on anecdotally by Pauling. Further, the amounts of lysine and vitamin C ingested varied significantly between individuals, but was generally in the range of between 3 to 6 grams per day of each supplement. Many within the study group reported rapid relief and positive responses. Though far from authoritative, the published case studies did help to bolster Pauling and Rath’s position, attracting increased interest in the work. However, the duo also received plenty of letters, some filled with irritation, from people who had incorporated supplementation and saw no positive change. Some correspondents, in fact, were getting worse. 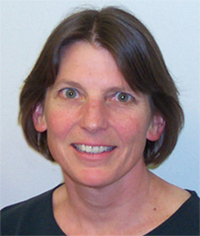 In 1989, a young medical doctor by the name of Matthias Rath began working at the Linus Pauling Institute of Science and Medicine. Rath had come from Germany, where he and his colleagues had uncovered evidence that the cause of plaque development in atherosclerosis (the hardening of arteries brought about by cholesterol deposits) was not a direct result of the presence of Low Density Lipoprotein (LDL), as had been previously thought. Rather, the Rath group found that LDL was synthesized in the liver into a new substance called lipoprotein (a), which binds to and carries cholesterol to sites throughout the bloodstream, building up on arterial walls in the process. In moving to the Pauling Institute, Rath brought with him a specific interest in the potential relationship between vitamin C and lipoprotein(a), or Lp(a). He hoped that, in collaborating with Linus Pauling, he might be able to more fully explain the preventative effects of vitamin C on cardiovascular disease that had been observed in vitamin C-deficient animal models. However, within the field, there existed significant skepticism as to whether vitamin C could actually affect Lp (a) levels in the blood, since these levels were not known to be modifiable by diet or drugs; – rather, the operating assumption was that the levels were genetically determined. Furthermore, concerns were raised that high doses of vitamin C might lead to an increased zinc-to-copper ratio in the blood, the end result being hypercholesterolemia and a concurrent increase in the risk of stroke or heart attack. Skeptics also argued that an intense regimen of vitamin supplementation might spur the development of kidney stones, due to the acidification of urine in patients unable to take sodium ascorbate for health reasons. Additional fears were expressed that large doses of vitamin C, vitamin E, and other nutrients that act as blood thinners might interact dangerously with blood-thinning medications taken by many heart patients already. Unsurprisingly, Rath and Pauling were hopeful that a solution could be found that would put to rest all of the naysaying. In this, the duo was driven by a belief that an optimum amount of vitamin C and other vitamins would mitigate any negative complications while simultaneously preventing a majority of heart disease. By February 1990, Rath and Pauling were preparing to run experiments using vitamin C-deficient guinea pigs with induced atherosclerosis. These trials, according to Pauling, were devised by Rath and based on the idea that lipoprotein (a) synthesis in a small number of animals might be correlate with the inability to synthesize vitamin C. Pauling remained involved mostly as an eager and interested advisor and patron for Rath’s work on the subject. In terms of their business arrangement, Pauling made it clear early on that Rath should not be held to the regular patent agreement for LPISM employees (25% royalties to the inventor, 75% to the Institute). Since Rath had developed the idea and foundational work outside LPISM, Pauling suggested a 50/50 split on the profits. In addition to his scientific work, Rath was also a peace activist, an outspoken opponent of international corporate exploitation, and an advocate for the control of nuclear weapons, and as such he had followed Pauling’s political exploits with great personal interest for many years. Perhaps because of these shared qualities and the growing connection between the two, Rath refused the favorable 50/50 deal that Pauling had recommended. Instead, Rath communicated to Pauling that he believed the Institute should receive any and all profits, leaving Pauling to infer that Rath required no royalties for what he viewed, in principle, as an effort to decrease the amount of suffering endured by people with heart disease. In the end, Rath never signed the Institute’s patent agreement at all. 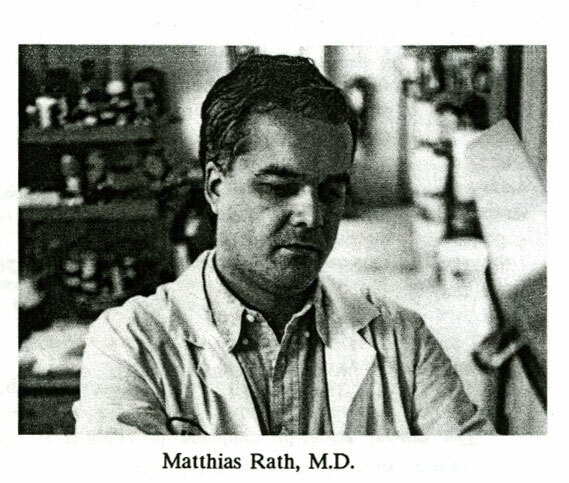 The first major paper to emerge out of Rath and Pauling’s collaboration was published in Proceedings of the National Academy of Science in December 1990 and titled “Immunological Evidence for the Accumulation of Lipoprotein(a) in the Atherosclerotic Lesion of the Hypoascorbemic Guinea Pig.” The publication reported on Rath’s study and showed that vitamin C protected arteries from fatty build-up at an intake of what would be about 5 grams a day in humans, as adjusted for weight. This dose stood in stark contrast to the much smaller Recommended Daily Allowance at that time, which was 50 mg.
With this paper, it appeared that Pauling had finally acquired a critical piece of evidence that he had been searching for ever since writing Vitamin C and the Common Cold in 1970: experimental proof that a widespread lack of vitamin C in the human diet was resulting in negative health consequences that ranged far beyond scurvy. Likewise, for Pauling, the Rath studies were a clear indication that the federally recommended dose, though sufficient to prevent scurvy, was by no means optimal. Rather, at 50 mg per day, humans were living in a state of chronic vitamin C deprivation and were suffering from a wide range of maladies as a result. From 1990 on, the connection between vitamin C and heart disease took center stage in Pauling’s life. Invigorated, he and Rath both saw the topic as a key new focus for research at the Institute, and a program that would pair well with growing national interest in orthomolecular medicine and in controlling health through diet. To promote this vision, The Linus Pauling Heart Foundation was established as a non-profit agency that aimed specifically to raise money to support the clinical trials needed to determine the exact value of different doses of vitamins needed to prevent cardiovascular disease. In addition to the vitamin C work, the Foundation also sought to generate funds that would support investigations into alternative heart therapies that used proline, lysine, and niacin. 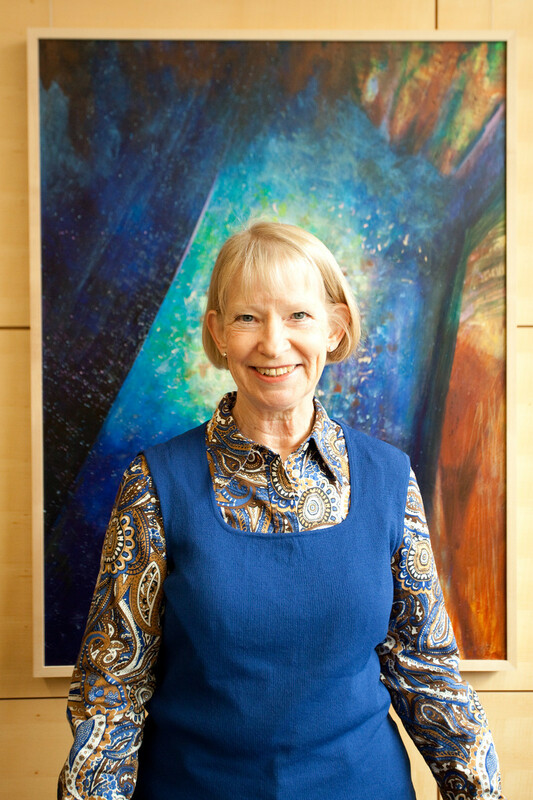 Once it was established, Pauling named Rath as president of the Foundation, which operated separately from the Institute, but with some financial backing. To draw support for the Foundation’s work, Pauling made regular appearances on media outlets in the San Francisco Bay Area. Likewise, over the course of the next two years, he issued a steady stream of press releases arguing in favor of the use of vitamin C, vitamin B3, nicotinic acid, and lysine to prevent and even reverse the onset of cardiovascular disease. In these, Pauling also alluded to the notion that Lp(a) might be implicated not only in heart disease, but also in diabetes and cancer. No specific optimal vitamin intake was ever detailed in the news releases. Instead, readers were encouraged to make donations to the Foundation so that research to better understand the role that vitamins play in controlling heart disease might more rapidly progress. Caricature of Linus Pauling created by Eleanor Mill and published in the Philadelphia Inquirer, May 1992. Health-conscious readers of a certain age have likely experienced a frustrating back and forth in food trends over the past several decades, and especially in the 1980s and 1990s. First eggs were said to be bad for you because they are high in cholesterol, then it was learned that they didn’t increase cholesterol in the blood. Likewise, butter was believed to be a health risk because of its high levels of saturated fats, however, butter (especially from grass fed animals, and especially as opposed to margarine) is now argued to be a valuable source of vitamins, minerals, and fatty acids. Chocolate and red meat, too, were decried for being too fatty or, in the case of chocolate, also too sugary. Yet today, both are viewed as useful and even valuable sources of nutrition, so long as they are consumed in moderation. These swings in consensus swept across the United States beginning in the 1970s largely in response to rising concerns over cardiovascular disease, or CVD. CVD includes a range of maladies such as angina, or heart attack, and many occur in conjunction with atherosclerosis, or the build-up of fatty plaques on arterial walls. Today, CVD remains the leading cause of death in the United States, claiming over 600,000 lives every year. As health professionals have sought to provide guidance on balanced eating, ideas have flip-flopped on the potential dangers of many foods because, over time, it has become increasingly clear that cutting these foods out of one’s diet altogether had little to no impact on rates of CVD. Linus Pauling was arguing in support of this point of view long before the data had been gathered to confirm it. Pauling believed that the trend toward removing eggs, red meat, and whole milk from American diets was an ill-advised scheme that restricted valuable sources of protein and nutrients from individuals who often could not afford substitutes for these staple foods. In Pauling’s view, it should have been clear to physicians and other health professionals that these dietary sources of cholesterol could not significantly impact total cholesterol levels in the blood, because cholesterol is synthesized, to a great extent, within the body due to its importance in the maintenance of cell membranes. The real problem behind heart disease, then, was not a high-cholesterol diet. The problem behind heart disease, Pauling argued, was a widespread failure to ingest a substance that could limit the body’s natural production of life-threatening cholesterol: Vitamin C.
As early as the late 1950s and early 1960s, researchers were uncovering evidence that high vitamin C intake reduced cholesterol in vitamin C-deficient guinea pigs, rats, and rabbits. Perhaps most notably, in the 1950s a Canadian group of researchers led by Dr. G.C. Willis found that above-average cholesterol intake did not result in plaque deposits in non-human subjects’ arteries so long as the diet was paired with a high-dose vitamin C regimen. Intrigued, Linus Pauling began a search for other champions of this view, and in 1972 he wrote to Dr. Donald Harrison at the Stanford Medical School of Cardiology inquiring into additional research that was being conducted on the interplay between vitamin C and a reduction in the risk of cardiovascular disease. Harrison responded that, although the results were not yet published, he had found lower levels of cholesterol in the livers of guinea pigs that had been fed non-trivial doses of vitamin C.
By 1976 many had come to accept that vitamin C played some role in the regulation of cholesterol metabolism and thus in the progression, or lack thereof, of atherosclerosis and CVD. In addition to Harrison’s studies at Stanford, preliminary work conducted by researchers at Pennsylvania State University found that ascorbic acid and ascorbic acid sulfate (two forms of vitamin C) significantly reduced atherosclerosis caused by cholesterol plaques in rabbits. However, at about this time, other research projects had suggested the opposite, and indicated that increased intake of vitamin C might in fact increase the risk of heart disease by inhibiting the absorption of copper in the intestinal tract. As a result of this inhibited absorption, the ratio of zinc to copper in the blood would stray from what is ideal and ultimately result in hypercholesterolemia: an imbalance in zinc and copper metabolism that is implicated in coronary heart disease. These findings created a scenario in which the Pauling camp was squared off against many physicians over the confusing and opposing views that large doses of vitamin C both reduced and increased one’s risk of cardiovascular disease. Throughout the 1970s, Pauling’s broad argument in favor of the fundamental importance of vitamin C to optimum human health was based on the idea that when primates lost the gene for vitamin C synthesis about forty million years ago, systematic physiological imbalances arose that continue to carry negative health consequences for humans today. Pauling was quick to point out that all animals require vitamin C to live and that most synthesize it naturally. Yet humans – primates who do not synthesize their vitamin C naturally – typically obtain far less of it in their diet (when adjusted for body weight) than do other primates and non-synthesizing animals like guinea pigs. In addition, animals of this sort, when fed moderate to low levels of vitamin C, showed increased risk for development of arterial plaques of cholesterol. What was less clear was whether or not this same effect was occurring in humans. Physicians opposed to Pauling’s view based their arguments on the idea that humans are physiologically different in important ways from the animals used to model the effects of vitamin C deficiency in the laboratory. Pauling scoffed at this notion and firmly believed that vitamin C deficiency in humans was the true cause of CVD. But even he could not fully explain exactly why vitamin C should be directly related to heart disease. Over a decade later, in 1989, when a scientist named Matthias Rath came to the Linus Pauling Institute of Science and Medicine, Pauling would finally find what he believed to be the key to explaining how and why vitamin C was so important to the well-being of the human heart. 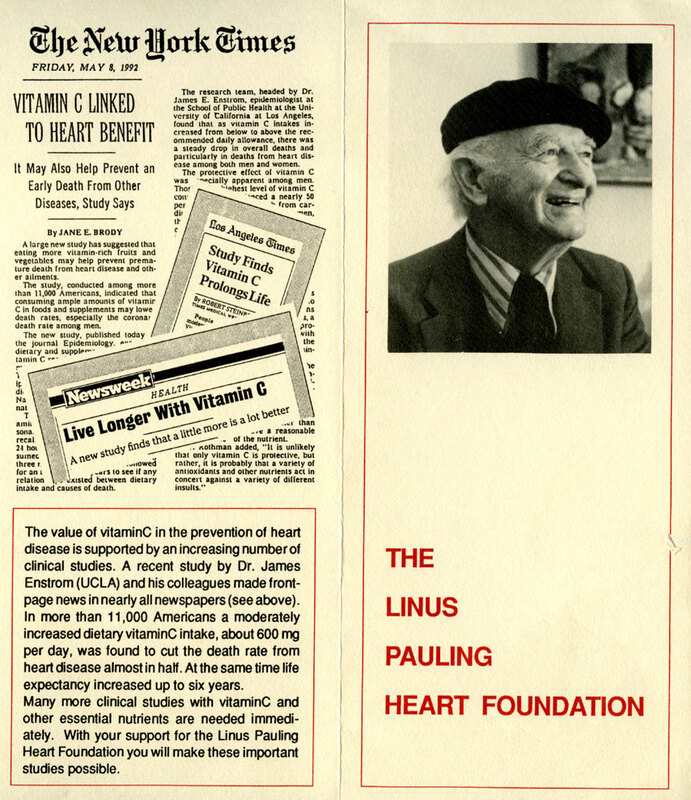 Promotional literature for the Linus Pauling Heart Foundation, ca. 1992.